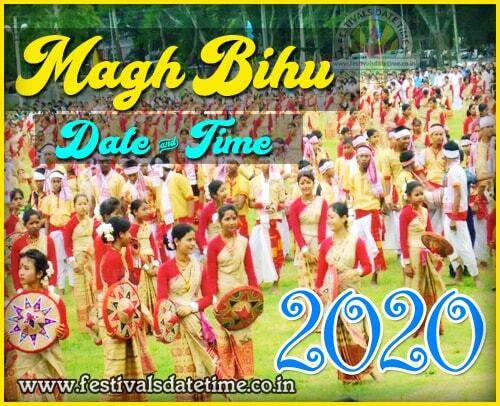 About Magh Bihu : Magh Bihu (also called Bhogali Bihu (Bihu of enjoyment) or Maghar Domahi) is a harvest festival celebrated in Assam, India, which marks the end of harvesting season in the month of Maagha (January–February). It is the Assam celebration of Sankranthi, with feasting lasting for a week. The festival is marked by feasts and bonfires.Young people erect makeshift huts, known as meji, from bamboo, leaves and thatch, in which they eat the food prepared for the feast, and then burn the huts the next morning.The celebrations also feature traditional Assamese games such as tekeli bhonga (pot-breaking) and buffalo fighting.Magh Bihu celebrations start on the last day of the previous month, the month of "Pooh", usually the 29th of Pooh and usually the 14th of January, and is the only day of Magh Bihu in modern times (earlier, the festival would last for the whole month of Magh, and so the name Magh Bihu). The night before is "Uruka" (28th of Pooh), when people gather around a bonfire, cook dinner, and make merry.